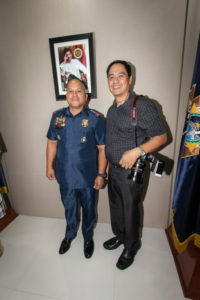 Early this week, I had a chance encounter with a controversial figure during a photo assignment in the person of Ronald “Bato” dela Rosa, the current Chief of Philippine National Police. Born in Barangay Bato, Sta. Cruz, Davao del Sur, he graduated from Mindanao State University with Bachelor of Science in Public Administration. He proceeded to enter the Philippine Military Academy and graduated in 1986. He earned his Masters Degree and Ph.D. in Development Administration from University of Southern Philippines in Davao City. Meeting Bato dela Rosa gave me the impression that he is a very down to earth and personable individual, devoid of any formality.